With the addition of motorized zoom lenses for both NetCam and NetCam Megapixel, you now have full control over your camera's optics. 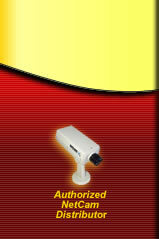 Zoom buttons on NetCam's live web page allow you too zoom in and out to adjust NetCam's field of view. Additionally, NetCam automatically adjusts the lens iris so you are no longer restricted to only daylight imaging. The zoom lenses have an optical zoom power of 6X, meaning that fully zoomed in view is 6 times stronger than the fully zoomed out view. For the NetCam, this translates to 6mm-36mm (or 33° to 7°). For the NetCam MP, 8mm-48mm (or 45° to 8°). The NetCam zoom lens connects directly to the back of NetCam (in the round AUX port). This provides the power for the lens as well as the communication lines. The lens consists of three controllable motors: zoom, iris and focus. The zoom lens is controlled via web buttons. The iris is automatically controlled from NetCam -- once a minute, a process evaluates the image exposure and adjusts the iris accordingly. The lens is pre-focused for infinity at the factory so changing the focus motor is rarely required. All three motors can also be controlled manually from a telnet session. Why Add A Zoom Lens? Control - Many NetCams, whether they are used for security, construction site monitoring or web attraction, can benefit greatly with the addition of a zoom lens. The power to remotely adjust NetCam's field of view gives you total control over what you are seeing. Day/Night Imaging - The automatic iris control of the NetCam zoom lens allows NetCam to produce high quality images in both day and night lighting. Unlike a fixed iris lens, the motorized zoom lens' iris opens and closes based on the amount of light. In the day, this means the iris is small, yielding a high quality image with excellent depth of field (which also protects the CCD sensor in NetCam). At dawn, dusk and night, the iris automatically opens all the way up, allowing more light to hit the CCD sensor. While not a night vision camera, NetCam can produce great nighttime images with minimal illumination. Variety - Spice up your live web shot with a different field of view. With a StarDot motorized zoom lens, you're no longer restricted to one static field of view.